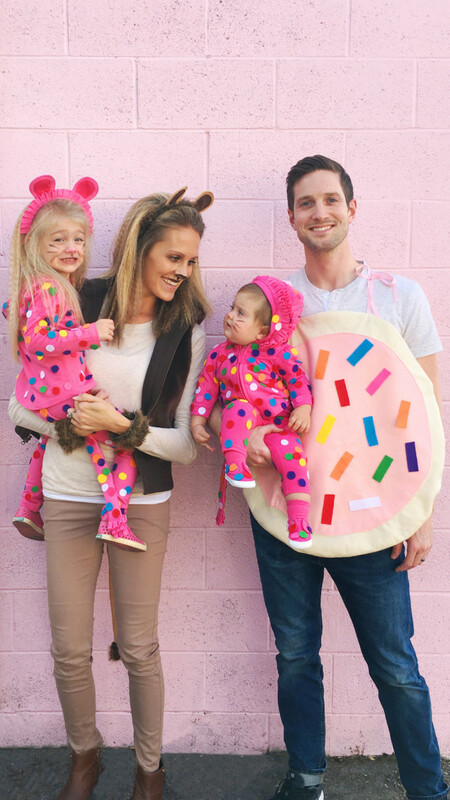 Today we are revisiting two of our favorite DIY costumes – the animal cookie costume and the original sugar cookie costume! These two combine in the best possible way: A cookie + lion = lion animal cookies! That’s right, only the most delightful family costume you could imagine! 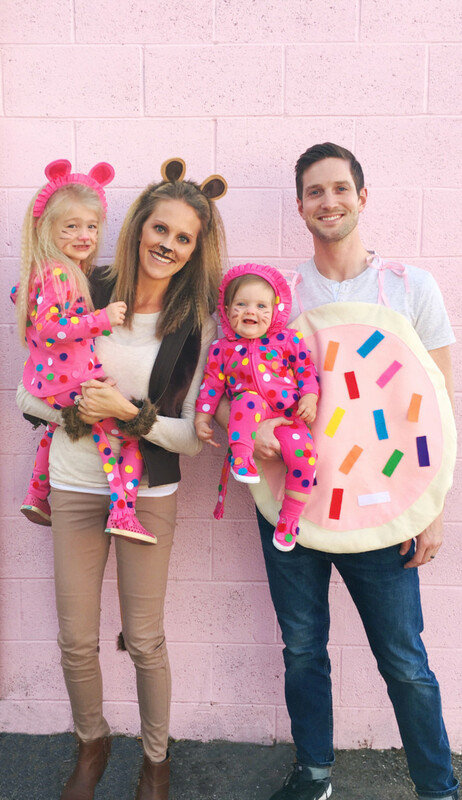 We love this family costume idea we are revisiting it again – see Machelle’s family two years ago! All of these costumes are quite simple to do so if you find yourself mere days before Halloween looking for a family costume we got you! 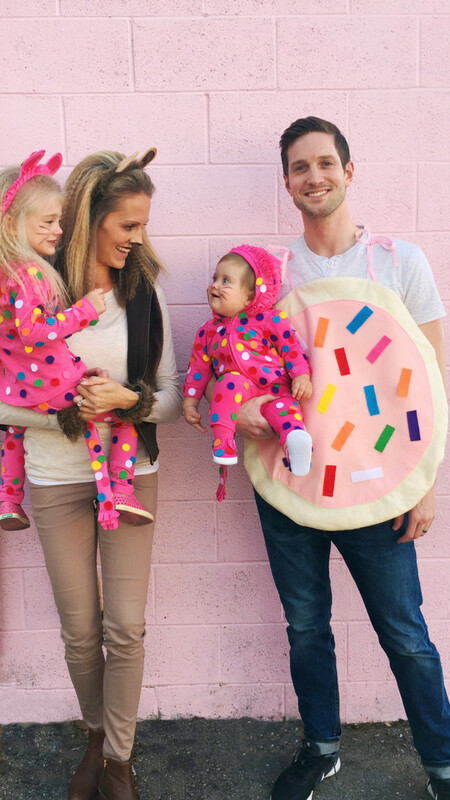 But first, how awesome does this family look? That is my husband’s twin, his wife Shayly and their two kids Ellie and Mila. Thanks for being the best models ever! 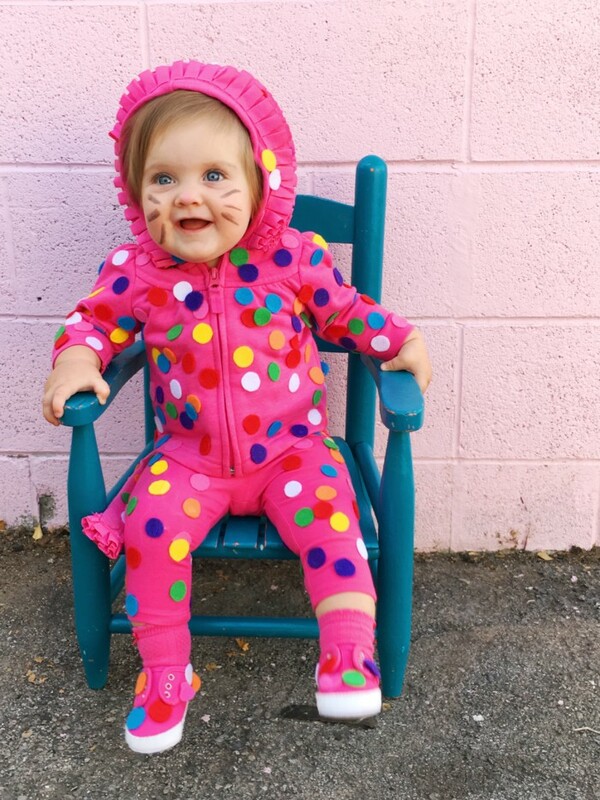 This animal cookie costume looks cute at any age but especially on babies and toddlers! And after Machelle originally using it for Stella two years ago I am still obsessed with it. 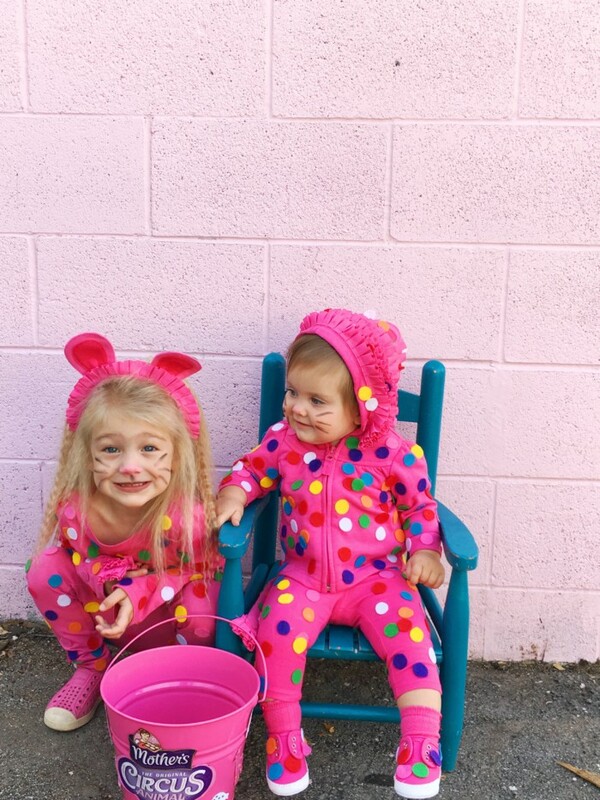 If you model yours after the Mother’s animal cookies (the best in our opinion) you just need all white or bright pink clothing. Next, you need a ton of colorful circles for your sprinkles to sew on the clothing! From there you can decide what type of animal you want to do. The lion is our favorite because it adds cute ruffles and ears but you could do an elephant, giraffe, and more! 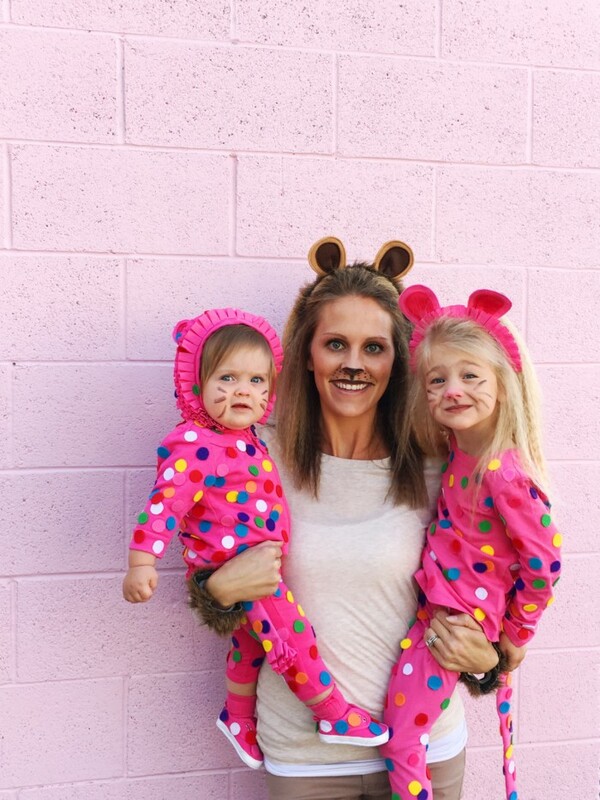 Next, get creative with the face painting and add some whiskers! Look how much Ellie, my adorable niece, loves this costume! 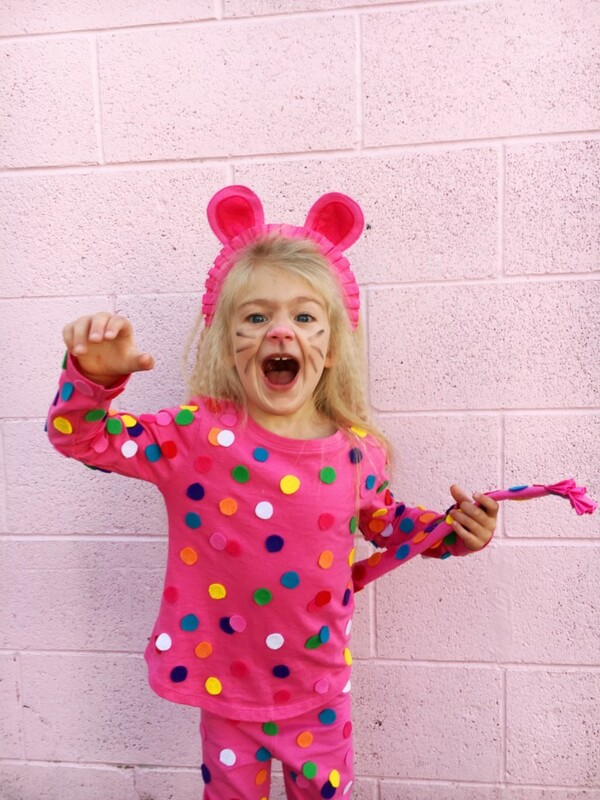 It is perfect for girls because it matches up girly sprinkles with the playfulness of dressing up as an animal. I still think it would be perfect for a boy though. The instructions for the circus animal cookie can be found here. 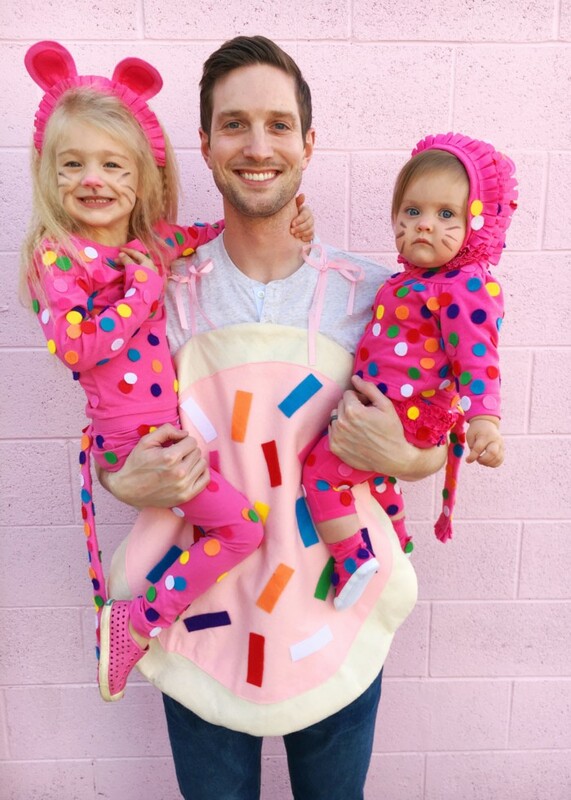 Both times we have done this costume the dad nicely offered to be the pink cookie! Or maybe they were told that is what they would dress up as. Either way it turned out great! This costume is simple as well and the instructions for this costume can be found here. Plus, at the end of the night he can simply slip the cookie off and be good to go! We even have instructions for the lion costume here! All you need is tan clothing, ears, and a tail! And you can add crimped hair like Shayly here for an extra fun detail!